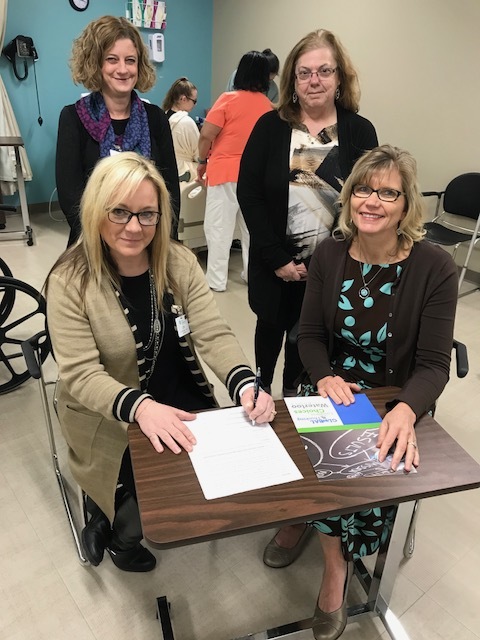 WATERLOO—Today a signing ceremony formally committed Care Initiatives to a sponsorship deal with the Waterloo Career Center housed in Central Middle School. Care Initiatives facilities employ over 420 people in Black Hawk County and over 3,000 people in the state of Iowa. They operate 44 facilities in Iowa alone and a hospice service serving 66 of Iowa’s 99 counties, including right here in Black Hawk County. Ravenwood, NorthCrest and Pinnacle Specialty Care are always on the lookout for staff with a caring touch and a desire to help others. the short term rehabilitation to home and the long term care sectors of healthcare. local clinics, hospitals and other health agencies like Care Initiatives facilities. Their nursing homes have been voted among the best skilled nursing care facilities in the Cedar Valley. “Care Initiatives provides a critical service for our community. By partnering with them, we know the students in our nursing program will gain the knowledge and skills needed to make them viable candidates for positions with Care Initiatives and other health professionals. We are very grateful for this collaboration,” said Dr. Jane Lindaman, Waterloo Schools superintendent. Care Initiatives is the latest of many local companies committing to career program partnerships with Waterloo Schools. Recently, Geater Machining and Manufacturing, VGM Forbin, Omega Cabinetry, University of Northern Iowa College of Education, John Deere Waterloo Operations and UnityPoint Health-Allen Hospital were announced as sponsors for the career center.